Idahoans are fed up with lawmakers like Gov. Butch Otter who cave to the interests of deep-pocketed donors rather than than step up to defend quality, affordable health care in our state. Thousands in Idaho fall into what we call the Coverage Gap. These hard-working folks have no health coverage at all, because even though they live in poverty, they don’t qualify for subsidized care, and don’t earn enough to purchase plans through Your Health Idaho, our state-run exchange. More than three-quarters of voters and our legislature’s Health and Welfare Committee support an initiative to expand and lower the cost of coverage in our state, but House Speaker Scott Bedke refuses to call this bill for a vote. Our hopes were raised last week when Governor Otter promised to end the deadlock and demand the speaker call a vote, if the public would turn out to show their support for the measure. Hundreds of us did show up, flooding the Statehouse Rotunda last Thursday. But who didn’t show? Governor Otter. He got cold feet. 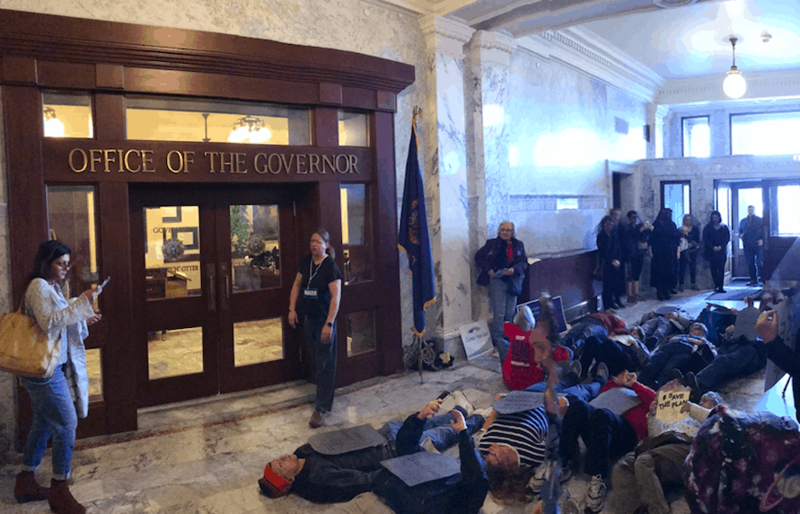 When it became clear that Governor Otter was having a change of heart, United Action for Idaho and United Vision for Idaho directed those who did show up to hold a die-in outside his office to demand action. We called on Otter to issue a public statement and explain why he wouldn’t demand Speaker Bedke call for a vote on a bill that would provide health care to 35,000 Idahoans who have none, move almost 3,000 more Idahoans into Medicaid, reduce premiums for everyone by 20 percent and save Idaho’s state health exchange. Dozens of people laid down, occupying the corridor of the capitol outside the governor’s office, holding gravestones to represent the Idahoans whose health and lives have been sacrificed by our lawmakers’ heartless failure to act. There are 78,000 of us who continue to suffer, after five years of trying to get the state to provide affordable health care to those living – and dying – in the Coverage Gap. Protesters chanted, “To the Floor!” “SHAME,” “Save the Plan – Save Our Lives,” “Bow Down Bedke” and “Vote Them Out.” Presbyterian Pastor Andrew Kukla offered a prayer for legislators to find their compassion and be discomforted by the actions of those who did show up to finally manifest their Courage to Care! After the die-in, protesters surrounded the third and fourth floor rotundas to send a message to all lawmakers who were in the House and Senate sessions that if Otter wouldn’t do his job, the voters will. Truth be told, Gov. Otter and our GOP-controlled legislature have no one to blame for this mess but themselves. 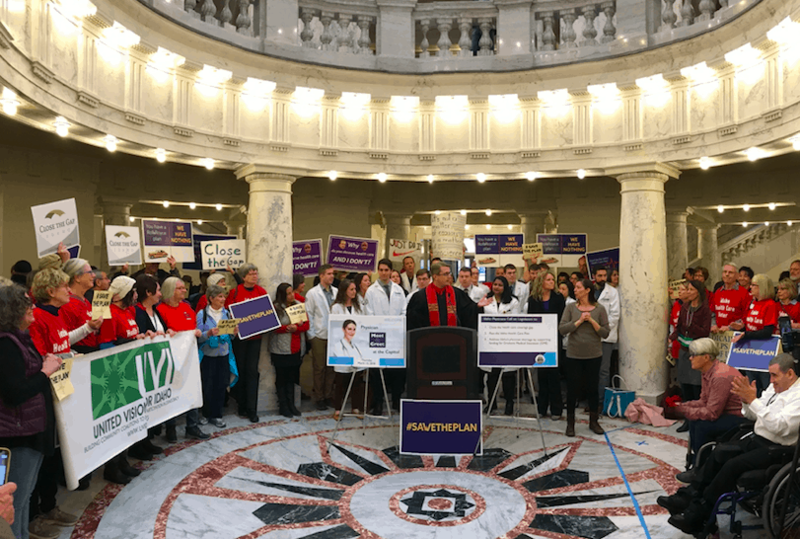 When they were offered the opportunity to expand health care coverage with federal funds, they refused it out of pride; as a result, Idahoans now pay more through their paychecks for less coverage. More of our dollars are being spent, for less. This speaks volumes about where the priorities of our elected officials really lie, and makes it clear that it is all about retaining their power, and not about making a difference in the lives of the people they are supposed to represent. Make no mistake: Idaho voters have now put lawmakers on notice that they can either take action to provide health care and represent the needs of their constituents, or prepare for people who are mobilizing across our state like never before to vote them out and take back the people’s house.